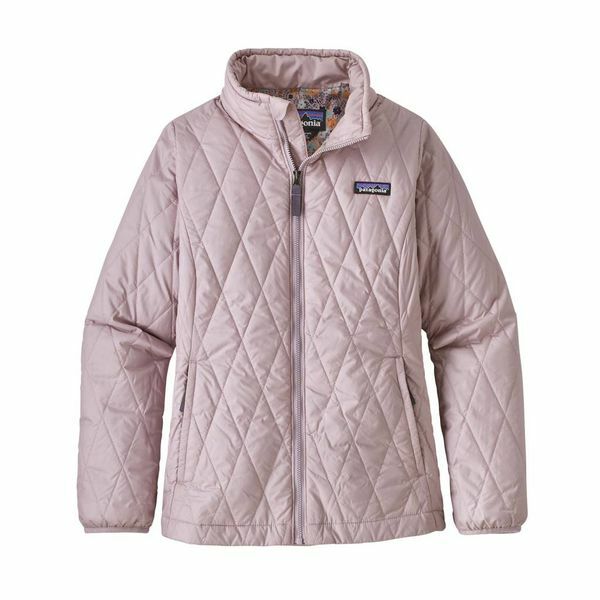 This quilted, insulated jacket is wind and water resistant. It is also super lightweight and warm. Great on its own or as a mid-layer. This warm girls’ jacket has a wind- and water-resistant 30-denier polyester mini-ripstop shell treated with a DWR (durable water repellent) finish, plus a wind-blocking polyester plain-weave lining. The full-zip front has an internal wind flap and spandex at the cuff; an adjustable drawcord hem also seals out cold air. Insulated with lightweight and compressible 60-g PrimaLoft® Gold Insulation Eco 100% polyester (55% recycled), the Girls’ Nano Puff® Jacket serves as outerwear in cool conditions or as a midlayer when temperatures drop. The zippered handwarmer pockets have reflective webbing pulls, and a hand-me-down ID label keeps track of the owner.